We have worked with CIPC application contractors to develop British Potato Council based systems on a practical scale, for helping distribute CIPC into the crop. Please visit www.cipccompliant.co.uk for the lastest information on being CIPC compliant. 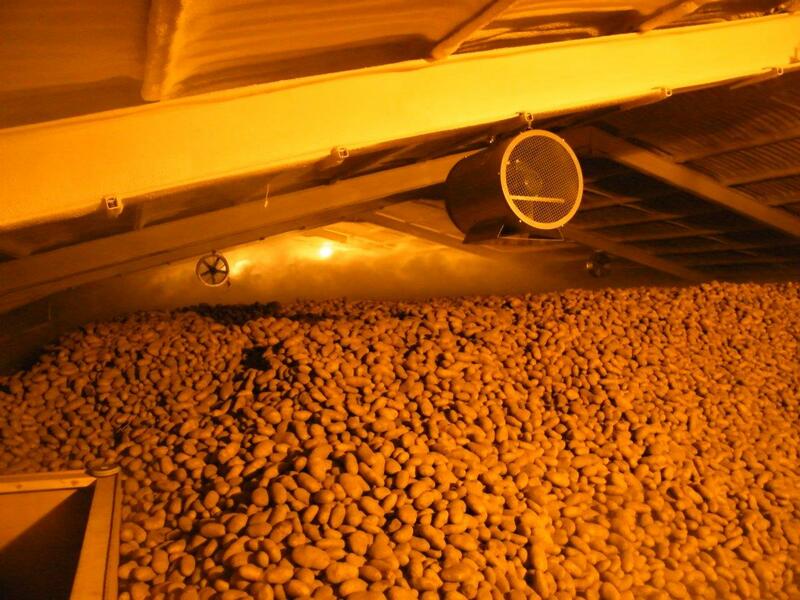 It is important to get the CIPC into contact with the potatoes and not stuck in the roof of the store. By injecting the CIPC into a covered space between the boxes the fog is forced into the pallet bases of the boxes and then rises into the boxes and crop. 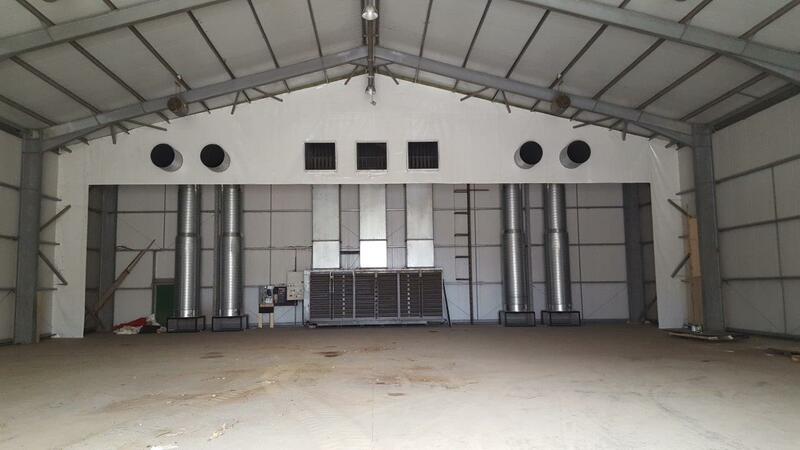 After the application process is complete in that passageway, fans positioned on top of the passageway are run slowly to pull the fog out of the roof space and recirculate it again through the boxes. The fan speed is gradually increased with time using an inverter control device. 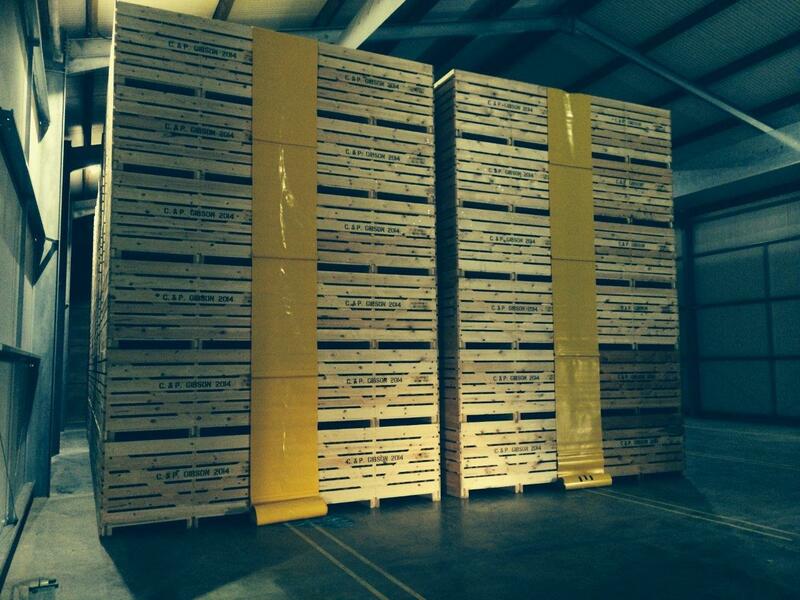 The strawson wall system allows for active recirculation of CIPC in an existing or new overthrow box potato store. This makes sure the store is compliant with the 2017 CIPC product label. A PVC or plywood wall is erected at the back of the store infront of the fridge unit, it blocks the sides and top of the store around the boxes to prevent the airflow from short circuiting back to the fridge without going through the boxes. The fridge tubes are extended through the wall. Additional fans are added to the side of the fridge to recirculate the CIPC as the gas should not go through the fridge evaporator. Recent research has shown benefits in the distribution of CIPC in bulk stores by slowly injecting gas into the system using the main fans – probably at 20-30% speed – controlled by an inverter. We position the control of the system adjacent to the CIPC port. Ideally the CIPC is injected upstream of the fans, however in some instances it is not possible, particularly when the fans are mounted on top of the duct. Low speed recirculation of CIPC fog can reduce the total dose of CIPC required over a season by providing a more even distribution of sprout suppressant. When using an inverter to slow the speed of the fans for CIPC distribution, it is important to make sure the airflow into the lateral ducts is balanced so the fog is distributed evenly. 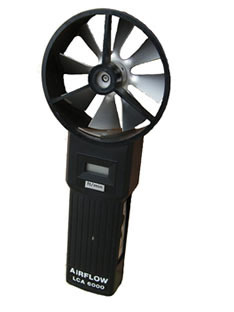 A vane anemometer can be used to measure the airspeeds going into each duct whilst the fans are running at the correct speed.